Tumblr has introduced new feature “Submissions” that can make any Tumblr blog into a buzzing community. 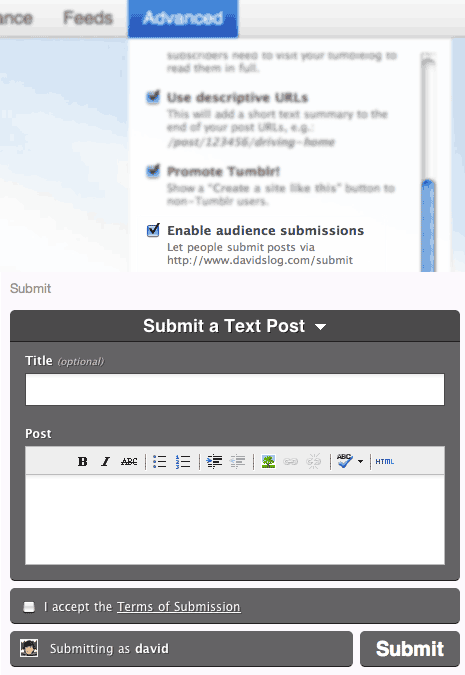 This feature allows any user to post on their favorite Tumblr blog using web based form or by sending email. To get started, you need to enable option “enable audience submissions” under advanced menu in your Tumblr dashboard. Then using web based form, users can submit their posts along with related photos, links and videos. This feature can for sure make Tumblr blog highly interactive. However, this can also bring lot of spam content trashing your blog. Try this new feature and see if your blog users are posting some worthy content. It is an easy way to allow users to express and contribute to their favorite blogs, what say?